Amazon Price: $614.04 $614.04 (as of January 24, 2019 1:14 pm – Details). Product prices and availability are accurate as of the date/time indicated and are subject to change. Any price and availability information displayed on the Amazon site at the time of purchase will apply to the purchase of this product. This rocker is designed to be cherished for decades. 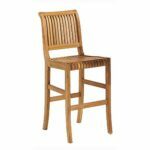 It's a classic in teak that can be enjoyed on the patio, a porch or indoors. Roomy seat design and a high back offer plenty of space for rocking little ones. Feature a tall concave back. Slat back and seat design. 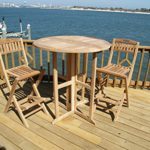 Made with kiln-dried, grade A Teak wood. Classic style. Minimal assembly required. Overall: 25 in. W x 34 in. D x 41 in. H (39 lbs.). 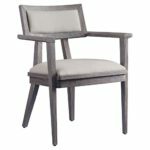 Seat height: 18 in.. Our rocking chairs collection is made for rocker lovers. Designed for generous comfort, the deep seat and raked back rest at an angle ideal for relaxing. Our Teak Rocking Chair is a versatile design, which makes this most popular. Simple and stylish for all your outdoor needs. It is a beautiful addition to your garden, backyard or patio furniture.